I don’t have too much time to blog (so, in other words, I’ll have to continue my spring break recap next week), but I wanted to share a new recipe! If you’ve been reading the last few months, you’ll know that I’m struggling to figure out a diet that works for me and my acid reflux. I still haven’t found a perfect balance yet, but I think that’s going to be my reality for a while…trial and error. Annoying? Yes. Worth it? I sure hope so. One item I’ve been trying to keep out of my diet is gluten. The other day I got some new flours to tinker around with: brown rice flour (still have to try that one, actually) and buckwheat flour. Despite its name, it is wheat- and gluten- free. In a small bowl, make the flax egg, and set aside. In a large bowl, combine dry ingredients (buckwheat flour through cinnamon). Add wet ingredients (water through vanilla, plus the flax egg) to dry, and stir until just combined. You don’t want to over stir pancake batter because it can make tough pancakes. Allow them to cook for about 2 minutes, or until bubbles start appearing in the center of the pancake. Flip and cook for another 2 minutes, or until they are golden-brown and cooked through. Now, for the berries. I’m somewhat embarrassed to even include this in the recipe as it is made up of literally one ingredient: frozen mixed berries. I simply microwaved about a cup of them for about a minute. 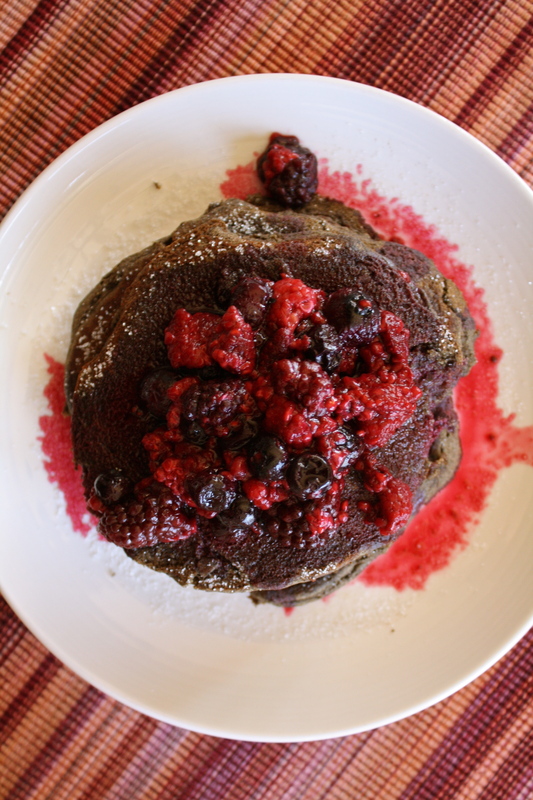 This resulted in some lovely, warm berries, and an equally lovely, velvety juice that acted as a sauce on the pancakes. Simple as that! Here’s how I serve my pancakes: I top them all with margarine or butter, and sprinkle sugar over the top. Then I stack them, pour over the berries and juice, and enjoy! 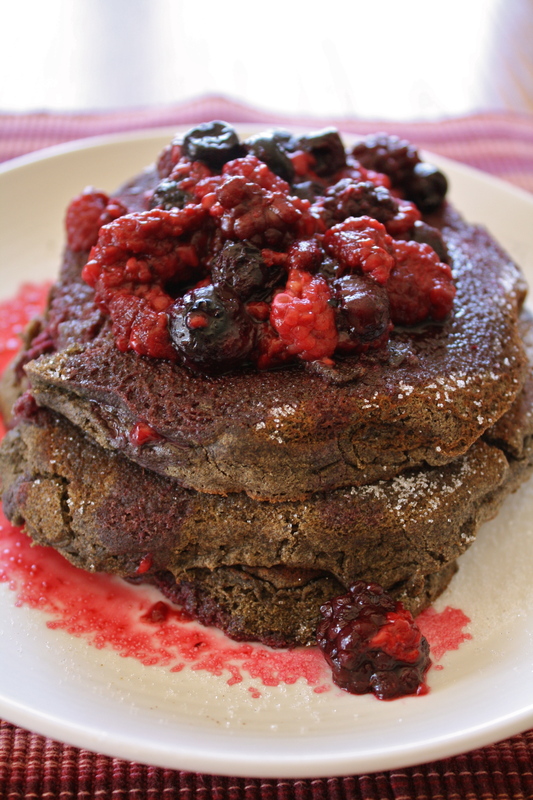 I did notice that because the texture was a bit dry (because of the buckwheat flour), I needed to add syrup to the stack, but that’s nothing to complain about! 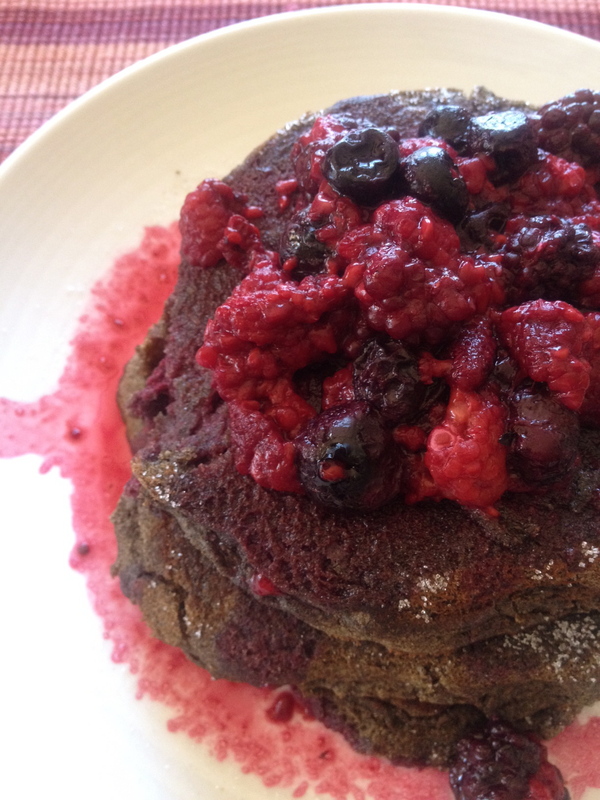 Have you ever tried using buckwheat flour? Or any other type of gluten-free flour? Do you like your pancakes plain or with fruit/chocolate/all the goods? ← Day Two, Part One: HARRY POTTER WORLD!